I love a good multigrain bread. If you’ve ever had a good tomato sandwich (or any other sandwich for that matter) on a piece of multigrain bread, or a piece of multigrain toast for breakfast, you’ll know it’s hard to beat for taste. We love my whole wheat bun recipe, but for fresh homemade bread, made from scratch, this recipe is one of my favorites. It’s also hard to beat for nutrition. This multi-grain bread recipe is packed full of whole wheat flour, flaxseed, sesame seeds, sunflower seeds, millet, and poppy seeds. I won’t go into the benefits of each of these seeds, but if you research the health benefits they’re pretty impressive, so you can feel good eating this or feeding it to your family, knowing you’re getting all sorts of healthy nutrients along with it. As long as we have this bread in the house, I don’t even have to worry about what’s for supper. This recipe was originally from my mom’s sister, but I made it a little smaller and changed some measurements a bit to make it turn out more evenly. Don’t let all the steps scare you. It’s worth it. This recipe makes six loaves which might seem like a lot, but it disappears so fast around here that it just makes sense to make that much at one time. If you want less, you can adjust the serving size on the recipe card below. 1. Heat 2 1/4 cups milk in small saucepan. 2. Add 1/2 cup each of millet, flax seed, poppy seed, sunflower seed, and sesame seed. 3. Add 6 Tablespoons butter. I like to add the butter now because it melts when you add it to the warm ingredients. You could also use any other healthy fat you like (lard, coconut oil). Allow to cool about half an hour or more until mixture is no longer hot. 4. Meanwhile to large mixing bowl, add 2 1/4 cups of warm water, 2 cups white flour, 1/2 cup sugar, and 1 Tablespoon yeast. Let the yeast grow until the seed mixture is cooled off. I’m using my Bosch Mixer here, which has made making bread so much easier, but you can also do this by hand. 5. Add seed mixture to mixing bowl. 7. Allow to rise one hour or until double in size. (Okay, so I completely forgot I was making bread and let this rise a couple of hours. I do not recommend doing this, especially with the plastic ring attached. I had a hard time getting it off.) If you are using a Bosch mixer, I’ve heard you can skip this first rise, but I’ve never tried it. 8. Punch down and divide into six equal sections (a little over a pound each). Let rise for 10 or 15 minutes. I usually just clean up the kitchen a bit and they’re ready to roll out. 9. Roll out into an oblong section with rolling pin. 10. Shape into loaves by rolling up dough while tucking in edges. 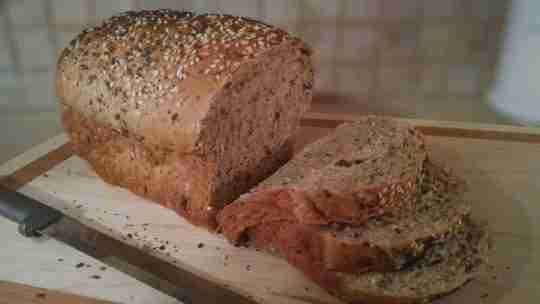 If desired, roll top in mixture of flax seed, poppy seed, and sesame seed. This makes a mess when you go to slice the bread, but it looks so pretty. And since they say the eyes eat first, you might want to try it. Place into greased bread pans. 11. Allow to rise until double in size. I rolled half of these in a seed mixture. And here’s a recipe card for you. I’d love to hear how this recipe turned out for you if you try it. Heat 2 1/4 cups milk in small saucepan. Add 1/2 cup each of millet, flax seed, poppyseed, sunflower seed, and sesame seed. Meanwhile to large mixing bowl, add 2 1/4 cups of warm water, 2 cups white flour, 1/2 cup sugar, and 1 Tablespoon yeast. Let the yeast grow until the seed mixture is cooled off. Add seed mixture to mixing bowl. Add 1 Tablespoon salt, 1/4 cup honey, 1/4 cup molasses, and 4 eggs. Mix well. Add 6-7 cups whole wheat flour. Add 1 to 1 1/2 cups white flour or until dough is firm. (Feel free to change ratios of white to wheat flour.) Allow to rise one hour or until double in size. Punch down and divide into six equal sections (a little over a pound each). Roll out into an oblong section with rolling pin. Shape into loaves by rolling up dough while tucking in edges. Place into greased bread pans. Allow to rise until double in size. Bake in preheated oven at 350 degrees for 30-35 minutes. (I actually bake mine at just below 350 for about 32 minutes.) Remove from pans and allow to cool. Enjoy! I have not made this yet but I am wondering why so much sugar, honey, molasses? Is it okay to reduce by one half? I’m sure you can reduce the sugar. Bread is very flexible. Keep in mind, though, that this recipe is for six loaves so it isn’t that much for each loaf. It’s actually less than a lot of other bread recipes out there.